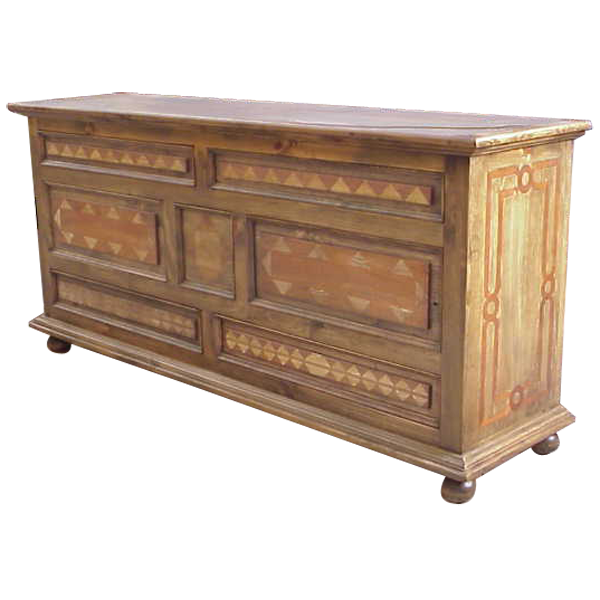 With its lovely, light finish, and hand carved, geometric designs, this handcrafted, Western style credenza will be a focal point wherever it is placed. For practical storage, the credenza has six, rectangular drawers and a compact, square drawer in the center. There is additional storage space inside the credenza. The two, top, rectangular drawers and the two, bottom, rectangular drawers are thin, but wide, and the two, rectangular drawers in the center are the largest. All of the drawers are adorned with exquisite, hand carved, geometric designs. Each side of the credenza is enhanced with a decorative, geometric cut panel, and the credenza rest on hand turned, bun style feet. The credenza is finished with a light brown, antique stain, and it is made with the best, sustainable, solid wood available. It is 100% customizable.